Flipgrid is a video-based discussion platform you can use to engage your students in a wide variety of learning experiences. The way it works is very simple: as a teacher you create a grid for your class, then you add a topic for discussion and students share their responses in short recorded videos. Students can also view and reply to each others video feedback and build a dynamic interactive learning community. As the creator of a grid, you get access to different moderating features that include the ability to password lock your grid and approve videos before they are shared with others in your grid community. And if you have a classroom blog or website, you can easily embed your grids and videos there. There are different ways to use Flipgrid in your instruction. You can use it for formative assessment or to gather students feedback about a topic or event. It can also be a good homework tool students draw on to record their replies to homework questions. 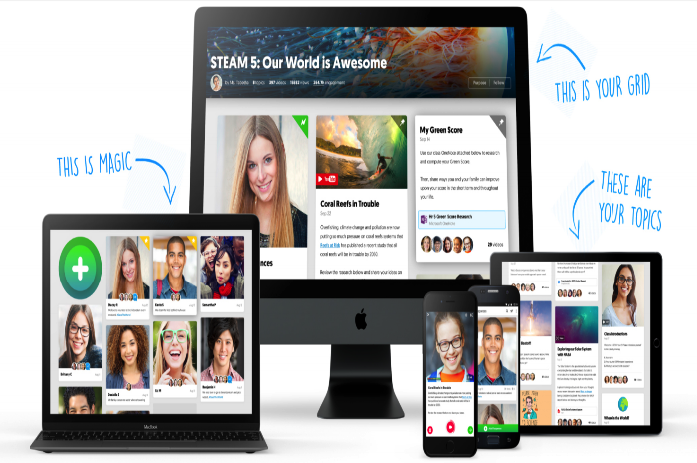 Additionally, students can use Flipgrid in immersive literacy projects including: a book or movie review, group discussions of a particular topic, record video explainers of learning processes, create tutorials and visual guides and many more. The strength of Flipgrid is that it empowers students voice and provides them with a venue through which they can express, produce, share and verbalize their learning.